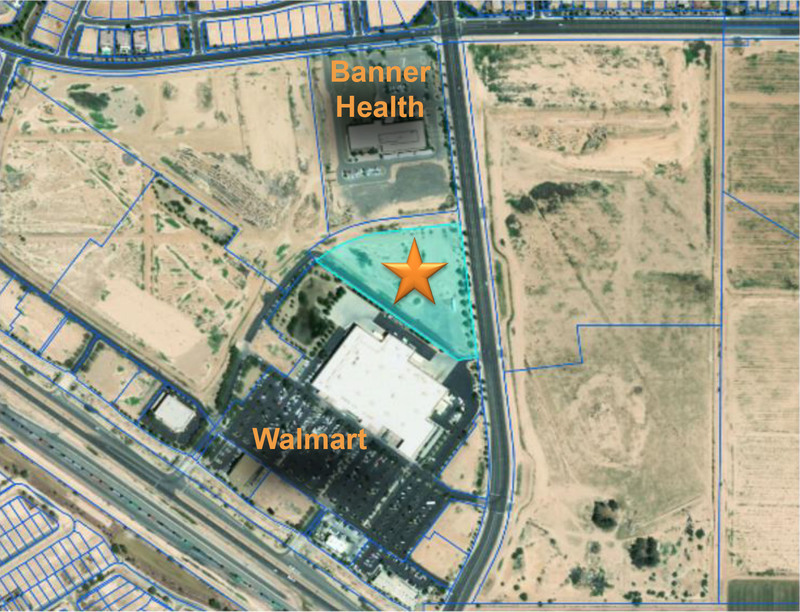 The proposed Vista Village property (star) is almost six acres. A developer wants to build a 100-unit apartment complex in Maricopa, and a vote by Maricopa City Council on Tuesday may spur the project. As proposed by Englewood Group, Vista Village will be constructed on a triangular, six-acre lot north of Walmart and south of Banner Health on Porter Road. The multi-building development would include two-story and three-story buildings with a pool, laundry, fitness center and playground. The city council approved the re-zoning of the property from light industry to general mixed use. It was not an approval of the project but allowed Englewood Group to start the development process. It would be the first apartment complex in the city. No member of the public or city council spoke against the re-zoning at the Tuesday hearing. Planner Rodolfo Lopez said the Development Services department did not receive any public comment, either. The rezoning was previously recommended by city staff and by the Planning & Zoning Commission. Development Services commissioned a study last year on housing needs in Maricopa. The idea of an apartment complex has been controversial in the past, with opponents saying rentals bring crime, but it has gained interest in the past year. The Housing Needs Assessment Report from July 2017 noted that 97 percent of Maricopa’s housing is single-family homes, far above the Arizona average of 64 percent. It found a lack of “work force” housing for teachers, police, etc. “For single people who wish to live alone, there are no housing options other than living alone in a large home,” the report stated. The result is two or more families renting one “single-family” home. Englewood, which has 74 properties in Arizona, Indiana and Illinois, has been eyeing Maricopa for more than a year.